The event started with the singing of Tamileelam national anthem while a prominent community activist Mr Appappillai Rajandra hoisted the Thamil Eelam flag. 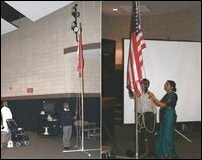 Dr. (Mrs.) Saroja Ilangovan hoisted the US flag. 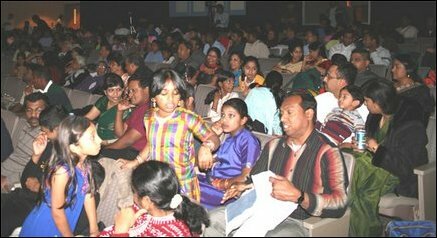 Cultural programs including dance, music, and drama followed. Dr. N Jeyalingam, President of a New York Tamil organization, speaking at the event explained the need for more participation of the Tamil diaspora in helping the tamils in Northeast. He called for increased political activism and outlined the efforts necessary for the diaspora to become politically effective. Visuvanathan Rudrakumaran, legal advisor to the Liberation Tigers and a member of the Liberation Tigers peace delegation, speaking at the event told the audience details of Geneva Talks that he participated, and explained grievous humanitarian situation in the northeast. Rudrakumaran explained the legal rights of US citizens with regards to anti-terrorism legislations of the United States. While the Anti Terrorism and Effective Death Penalty (AEDPA) amended by the Patriot Act and Intelligence Reform and Terrorism Prevention Act prohibits providing material support to designated organizations, "the Statute does not prohibit being a member of one of the designated groups or vigorously promoting and supporting the political goals of the group,” he said. The Material Support provision is defined as "Currency or other financial securities, financial services, lodging, training, safe house, falls documentation or identification, communication equipment, facilities, weapons, lethal substances, explosives, personnel, transportation and other physical asserts except medicine or religious materials." The Statute also says that "Nothing in this section shall be construed or applied so as to abridge the exercise of rights guaranteed under the First Amendment," Rudrakumaran said.